Typical Tuscan farmhouse, stands on the hill of Monte Meto overlooking the Versilia coast, in a breathtaking panoramic position overlooking the lake of Massaciuccoli and see the sea, which was the residence so beloved by the composer Giacomo Puccini, and the Versilia coast. This cozy and elegant residence is set in the typical green of these areas, olive trees and orchards that are in this position their natural habitat for its mild climate all year round. The villa has been restored with the Tuscan style, giving importance to details and materials, typical of this area such as wood, terracotta and stone. The house has been furnished with simple furniture, refined and valuable giving each room its own special character. Not far from the house lies the picturesque village of Corsanico, which offers many scenic corners. 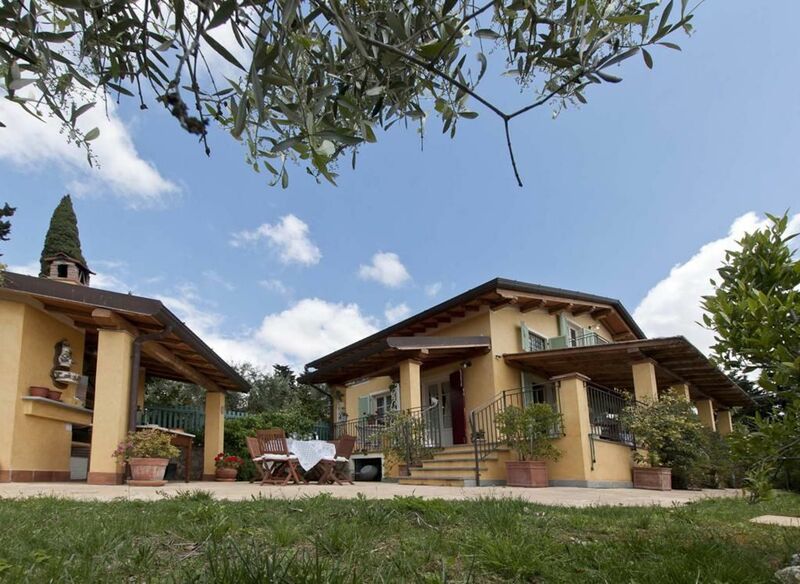 The villa is also close to the international airports of Florence (45 ') and Pisa (30') and a few minutes you can reach the famous seaside resort of Viareggio, Lido di Camaiore and Forte dei Marmi. Air conditioning satellite TV LCD stereo with CD player Wi-Fi dishwasher microwave oven kettle american coffee machine moka toaster American fridge for kitchen blender ice machine juicer cot high chair iron and ironing board hairdryer washing machine and books mosquito nets magazines. the house is located on a hillside and consists of ground floor, first floor and basement. The main entrance, located on the ground floor, opens onto an open plan kitchen with breakfast table and adjoining dining room with antique table with 8 seats, living room with wood fireplace and three French windows with sea views and with direct access to the porch furnished. Next to the living room leads to a double bedroom (with joinable beds) with adjoining bathroom with shower. Also on the ground floor, next to the bathroom there is the laundry room with French doors to the back garden. Via a flight of stone stairs leads to the upper floor comprises a double bedroom with en suite bathroom with bathtub, a triple and a single bedroom sharing a bathroom with shower. From the dining room through the staircase leads to the basement with equipped kitchen, large dining table and the living room sofa and stone fireplace. The house is set in an estate of about 6,000 square meters, distributed among olive groves and fruit trees that adorn the cozy garden enriched, moreover, by a synergic vegetable garden available to guests. Areas lawn alternate typical green zones in the area, perfect for enjoying the peace of mind that the environment provides. Two spacious porches are placed respectively in front of the kitchen and in front of the living room on the ground floor with tables and chairs for outdoor dining. Adjacent to the pool an area dedicated to barbecue and the wood oven invites to spend serene conviviality; while, close to the dedicated parking area, there is a built-in gazebo with foosball suitable to spend moments of games. The pool offers beautiful views across the coast and the hill. The pool overlooking the amazing landscape that generously offers this striking position; It is located on a terrace next to the villa, surrounded by a hedge not too high which does not prevent the view and is accessible via a short flight of stairs. The rectangular pool with stone edge and coated PVC gray pearl with roman steps for access to the water, measuring 8 x 4 m with a depth of 1.20 m. The purification plant is salt, is enhanced by the lighting both inside and outside. Around the pool is a sunbathing area equipped with sun beds and umbrellas, and beach chairs. Finally the guests, there is a shower with hot water. The pool is open from the last Saturday in April until the first Saturday in October. The price includes assistance and fast cleaning twice a week. The house is set in an estate of about 6,000 square meters, distributed among olive groves and fruit trees that adorn the cozy garden enriched, moreover, by a synergic vegetable garden available to guests. Areas lawn alternate typical green zones in the area, perfect for enjoying the peace of mind that the environment provides. Two spacious porches are placed respectively in front of the kitchen and in front of the living room on the ground floor with tables and chairs for outdoor dining. Adjacent to the pool an area dedicated to barbecue and the wood oven invites to spend serene conviviality; while, close to the dedicated parking area, there is a built-in gazebo with foosball suitable to spend moments of games. The pool offers beautiful views across the coast and the hill. The price includes service and fast cleaning twice a week. Very good house for our family holiday with amazing view and perfect pool for the kids. With 2 families we enjoyed the house very much. All the bedrooms are air conditioned which is perfect. The house is nicely styled and provides all things necessary. The outside kitchen we used a lot, amazing pizza oven en grill bbq. The pool is not very big but perfect for children. The house is on a hill in the country side. Little narrow roads and some driving skills take you there but that has it's charme and the view from the house is a big reward overlooking a valley with thousands of olive trees towards the Mediterrenean sea. We enjoyed the area, visited the 'Bagno's' in Lido di Camaiore and Marina di Santapietra. Lucca is a must as also the market in Forte dei Marmi. Most of all we loved Gelateria Amore e Psiche in the valley small town of Piano di Conca. Best fresh home made icecream we ever had. All in all it was a very nice experience. The gardener gave us tomatoes and plums from the garden. Everywhere were rosemary plants, basil and even chili peppers. We loved our week in the farmhouse!! Wir haben in dem wunderschönen Haus von Vittorio Giusti einen sehr schönen Urlaub verbracht. Das Haus liegt auf einem sehr schönen Anwesen mit eigenen Parkplatz. Der Ausblick, Pool und das separate Grillhäuschen sind ebenfalls sehr schön. Die Ausstattung des Hauses ist wie beschrieben und es gibt sogar eine Alarmanlage. Allerdings gab es ein paar Dinge die uns nicht gut gefallen haben. Insbesondere die Organisation war etwas holprig. So wurde das Haus während unseres Aufenthaltes nicht durch das Reinigungspersonal gereinigt und der Fliegenschutz an den Fenstern war an vielen Fenstern beschädigt und war damit unwirksam. Wir waren mit einer befreundeten Familie dort und haben das Haus so mit 4 Erwachsenen und 4 Kindern genutzt. Leider ist ein Bad im Obergeschoß nur eingeschränkt nutzbar, da die Dachschräge sehr weit in das Zimmer hereinragt. Weiterhin war die Spülmaschine nicht mehr zu gebrauchen, das Geschirr wurde nicht gereinigt, sodass alles eigentlich mit der Hand gespült werden musste. Lucca 'beautiful' has a lot to offer to tourists: the city is easily explored on foot or by bicycle, for both small and for the extensive pedestrian zone in the center. There are many places to visit, among them it is worthwhile to mention the walls, ideal place to enjoy a stroll in any season, Piazza Amphitheater, famous for its elliptical shape, Torre Guinigi, crowned by an old oak tree. Just outside Lucca, ten kilometers find beautiful villas like Villa Reale, Villa Mansi, Villa Torrigiani. In its surroundings are a lot of interesting places, both artistic and naturalistic: the Garfagnana, La Piana di Lucca, the Serchio Valley For those who wish to combine the beauty of the scenery pleasant days of sea, the coast of Versilia, with its famous sites like Viareggio, Forte dei Marmi, Marina di Pietrasanta, is only a few kilometers. It can be a good starting point for visiting the famous Cinque Terre. Easily accessible by car from Florence is connected by the A11 Florence-Pisa (toll Lucca Lucca East and West), also called Firenze Mare From Genova you can use the A12 Genova-Rosignano. The train station is located just outside the walls, hence the center can also be reached on foot in a few minutes, and connects the city with Florence, Pisa, Viareggio, Aulla. From Firenze then you reach all the cities of Italy. It is in the municipality of Massarosa generated the fraction of Mommio Castle, which preserves the character of the typical feudal castle: on top of the main building, at the foot of the village and between the one and the other the church. Important is the castle of Meto, built with massive foundations and large square stones. More than a real castle had to be a high signal tower with a good defensive system around. The expanse of olive trees that can be seen from the hill inspired the famous poem "Alpe di Mommio" by Gabriele D'Annunzio.